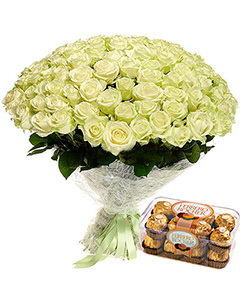 Delicate bouquet of roses will delight and surprise even the most demanding and sophisticated. White roses, wrapping. Shorts roses 40-50 cm. Action! Candy "Ferrero Rocher" for free.